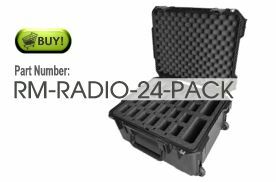 Mobile case accommodates 24 AN/PRC-154 Rifleman Radios and accessories. iPad Mini Charging Station protects and charges 20 iPad Mini's. The Motorola XTS 5000 Radio Case holds six radios and charger unit. Matrix Shipping Cases are built specifically for your equipment.